MADISON, Wis. (CNS) — Rain or shine, life is precious and a gift from God. More than 500 people were probably reflecting on that as they marched from St. Patrick Church in Madison to the Wisconsin Capitol Jan. 22 — the 45th anniversary of the U.S. Supreme Court’s Roe v. Wade decision to legalize abortion at all stages of pregnancy in all 50 states. Sponsored by the Diocese of Madison, the event was the first of its kind in about 20 years in Madison and was one of many held around the country, including in Washington, to mark the 1973 decision. “It’s important (to march for life) because it’s exactly what God calls us to do,” said Deacon Jim Hoegemeier, associate director of Madison’s diocesan Apostolate for Persons with Disabilities. Before the march to the Capitol, schoolchildren, members of area parishes and staff from diocesan offices gathered for a Rosary for Life and Mass at St. Patrick Church, which is part of downtown’s Cathedral Parish. Several priests from around the diocese came to pray the rosary and concelebrate the Mass. “One abortion is one too many,” he added. After Mass, as people exited St. Patrick into the rain, umbrellas were hurriedly opened, hoods were quickly raised over people’s heads, signs were held and a line formed ready to head to the Capitol. Prayer was followed by 60 seconds of silence for those who have lost their lives to abortion in the past 45 years. More than 60 million lives have been lost to abortion since the high court’s 1973 decision. The participants went inside the Capitol and took with them one of dozens of roses and the name of a state lawmaker to whom to give it. 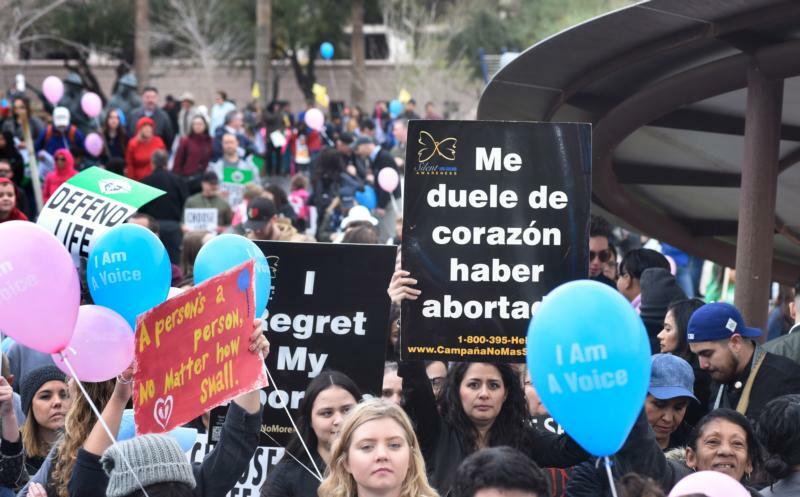 Across the country in Arizona, a chilly overcast day did not deter an estimated 4,500 people from gathering Jan. 20 to celebrate life and raise awareness for a growing pro-life movement at the Arizona for Life March and Rally in downtown Phoenix. Mary Fowler, a 15-year-old who attends St. Timothy Parish in Mesa, Arizona, was excited to carry one of the banners at the start of the march, adding that she is proud to show what she believes in by fighting to end abortion. That was the message of the march and rally, organized by the Arizona Life Coalition — to be a voice for the voiceless. Phoenix Bishop Thomas J. Olmsted, one of the speakers at the rally, talked of Catholics’ mission to be that voice and to lift up the dignity of human life. Jim Ward of Blessed Sacrament Parish in Scottsdale, Arizona, said that pro-lifers have been fighting an abortion war ever since Roe v. Wade and feels rallies like the one in Phoenix are necessary to boost the morale of pro-lifers who may feel weary from the battle. The event began at Cesar Chavez Plaza in downtown Phoenix. Thousands of people then made the roughly one-mile march to hear the speakers. Marchers carried pink and blue balloons that read, “I am the voice.” Parishes from around the diocese carried banners, and individuals decorated signs with Bible verses, J.R.R. Tolkien quotes and even Dr. Seuss verses. Among the teenagers in attendance was 15-year-old Pierce Vittone of St. Thomas the Apostle in Phoenix. Wondrash is a reporter at the Catholic Herald, newspaper of the Diocese of Madison. Contributing to this story was Margaret Naczek of The Catholic Sun, newspaper of the Diocese of Phoenix.